CAIDA’s Internet topology mapping experiment running on our Ark infrastructure has collected traceroute-like measurements of the Internet from nodes hosted in academic, commercial, transit, and residential networks around the globe since September 2007. Discovery of the full potential value of this raw data is best served by a rich, easy-to-use interactive exploratory interface. We have implemented a web-based query interface — henya — to allow researchers to find the most relevant data for their research, such as all traceroutes through a given region and time period toward/across a particular prefix/AS. 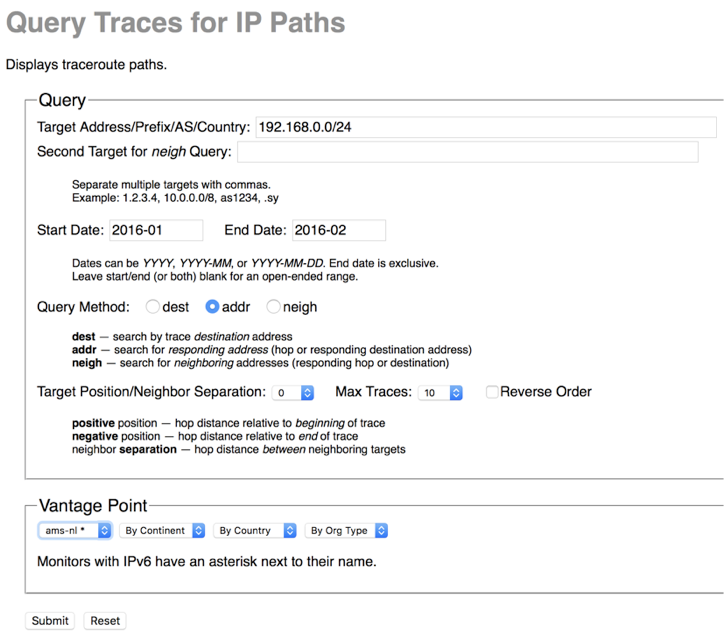 We hope that Henya’s large-scale topology query system will become a powerful tool in the researcher’s toolbox for remotely searching CAIDA’s traceroute data. Built-in analysis and visualization modules (still under development) will facilitate our understanding of route and prefix hijacking events as well as provide us with the means to conduct longitudinal analysis. Below we show a screenshot of Henya’s query interface, but Young Hyun, Henya’s creator, also created a useful short introduction video. The work was funded by the Department of Homeland Security (DHS) Science and Technology Directorate, Cyber Security Division DHS S&T/CSD) Broad Agency Announcement 11-02 and SPAWAR Systems Center Pacific via contract number N66001-12-C-0130, and by Research and Development Canada (DRDC) pursuant to an Agreement between the U.S. and Canadian governments for Cooperation in and Technology for Critical Infrastructure Protection and Border Security. The work represents the position of the authors and necessarily that of DHS or DRDC. CAIDA’s Vasileios Giotsas had the opportunity to present PERISCOPE: Standardizing and Orchestrating Looking Glass Querying to the folks at NANOG68. The presentation covered his work on the Periscope Looking Glass API. The work sets out to unify the heterogenous thousands of autonomously operated Looking Glass (LG) servers into a single unified standardized API for querying and executing experiments across the collective resource as a whole. From the beginning, we understood that while the hosting networks make these services public, usage policies varied and many LG services request clients rate limit their queries or impose rate limits and some forbid automated queries entirely. We do our best with Periscope administration to respect LG resources and implement conservative client rate limiting enforcing a per-user and per-LG rate limits. We identify our clients to provide transparency and accountability. We believe the Periscope architecture brings several primary benefits. The LG data complements our current trace data and extends the topology coverage. It allows us to implement intelligent load design across all LG servers, uses caching to reduce the number of redundant queries, and makes more efficient use of the LG resources as a whole. Finally, Periscope improves troubleshooting capabilities (often the reason for supporting these services in the first place). A webcast of the NANOG68 Periscope presentation is available, as well as the accompanying slideset presented at NANOG68. V. Giotsas, A. Dhamdhere, and k. claffy, “Periscope: Unifying Looking Glass Querying“, in Passive and Active Network Measurement Workshop (PAM), Mar 2016. This work was supported in part by the National Science Foundation, the DHS Science and Technology Directorate, Cyber Security Division (DHS S&T/CSD) and by Defence R&D Canada (DRDC). In the past year, we have made substantial progress on a system to measure congestion on interdomain links between networks. 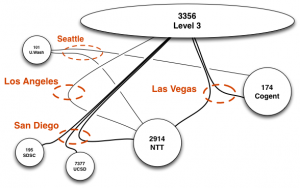 This effort is part of our NSF-funded project on measuring interdomain connectivity and congestion. The basic nugget of our technique is to send TTL-limited probes from a vantage point (VP) within a network, toward the near and the far end of an interdomain (border) link of that network, and to monitor diurnal patterns in the near and far-side time series. We refer to this method as “Time-Series Latency Probing”, or TSLP. Our hypothesis is that a persistently elevated RTT to the far end of the link, but no corresponding RTT elevation to the near side, is a signal of congestion at the interdomain link. It turns out that identifying interdomain links from a VP inside a network is surprisingly challenging, for several reasons: lack of standard IP address assignment practices for inter domain links; unadvertised address space by ISPs; and myriad things that can go wrong with traceroute measurements (third-party addresses, unresponsive routers). See our paper at the 2014 Internet Measurement Conference (IMC) for a description of these issues. 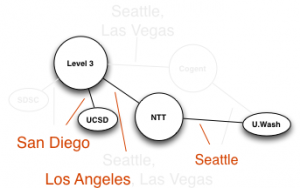 To overcome those challenges and identify network borders from within a network, we have developed bdrmap, an active measurement tool to accurately identify interdomain links between networks. A paper describing the bdrmap algorithms is currently under submission to IMC 2016. Our second major activity in the last year has been to develop a backend system that manages TSLP probing from our set of distributed vantage points, collects and organizes data, and presents that data for easy analysis and visualization. A major goal of the backend system is to be adaptive, i.e., the probing state should adapt to topological and routing changes in the network. To this end, we run the bdrmap topology discovery process continuously on each VP. Every day, we process completed bdrmap runs from each monitor and add newly discovered interdomain links or update the probing state for existing links (i.e., destinations we can use to probe those links, and the distance of those links from our VP). We then push updated probing lists to the monitor. This adaptive process ensures that we always probe a relatively current state of thousands of interdomain links visible from our VPs. Third, we have greatly expanded the scale of our measurement system. We started this project in 2014 with an initial set of approximately ten VPs in 5-6 access networks mostly in the United States. We are now running congestion measurements from over sixty Archipelago VPs in 39 networks and 26 countries around the world. Our Ark VPs have sufficient memory and compute power to run both the border mapping process and the TSLP probing without any issues. However, when we looked into porting our measurements to other active measurement platforms such as Bismark or the FCC’s measurement infrastructure operated by SamKnows, we found that the OpenWRT-based home routers were too resource-constrained to run bdrmap and TSLP directly. To overcome this challenge, we developed a method to move the bulk of the resource-intensive processing from the VPs to a central controller at CAIDA, so the VP only has to run an efficient probing engine (scamper) with a small memory footprint and low CPU usage. We have deployed a test set of 15 Bismark home routers in this type of remote configuration, with lots of help from the folks at the Bismark Project. Our next target deployment will be a set of >5000 home routers that are part of the FCC-SamKnows Measuring Broadband America infrastructure. A fourth major advance we have made in the last year is in visualization and analysis of the generated time series data. 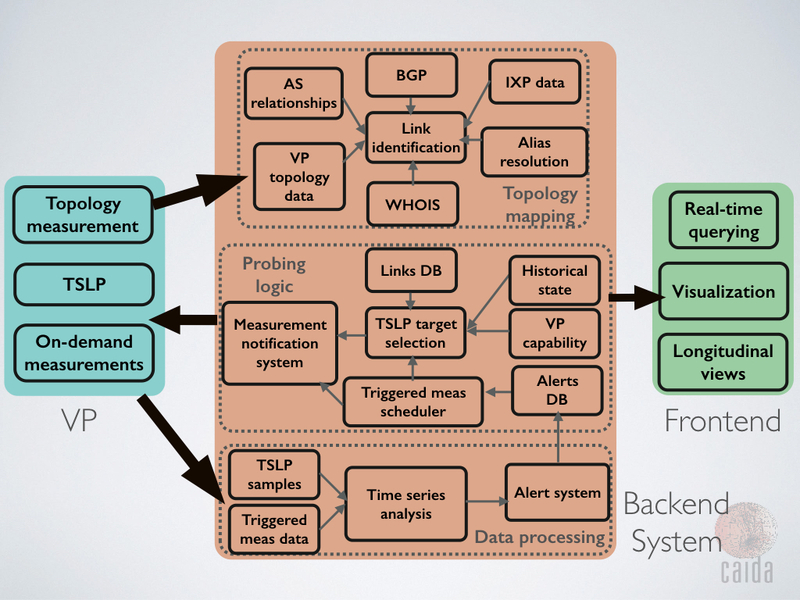 We were on the lookout for a time series database to store, process and visualize the TSLP data. After some initial experimentation, we found influxDB to be well-suited to our needs, due to its ability to scale to millions of time series, scalable and usable read/write API, and SQL-like querying capability. We also discovered Grafana, a graphing frontend that integrates seamlessly with the influxDB database to provide interactive querying and graphing capability. Visualizing time series plots from a given VP to various neighbor networks and browsing hundreds of time series plots is now possible with a few mouse clicks on the Grafana UI. The figure below shows RTT data for 7 interdomain links between a U.S. access provider and a content provider over the course of a week. This graph took a few minutes to produce with influxDB and Grafana; previously this data exploration would have taken hours using data stored in standard relational databases. As the cherry on the cake, we have set up the entire system to provide a near real-time view of congestion events. TSLP data is pulled off our VPs and indexed into the influxDB database within 30 minutes of being generated. 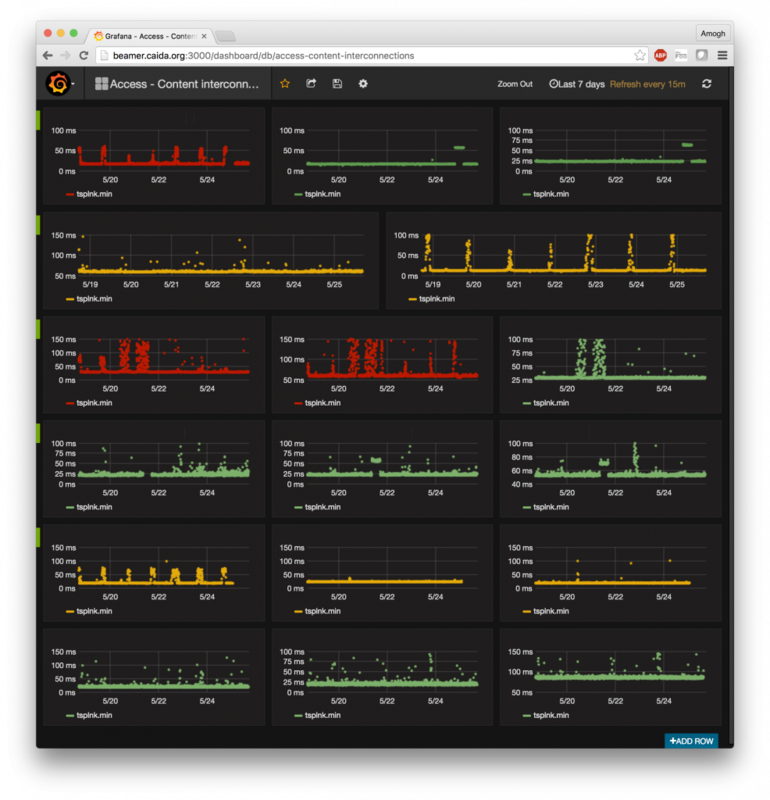 Grafana provides an auto-refresh mode wherein we can set up a dashboard to periodically refresh when new data is available. There is no technical barrier to shortening the 30-minute duration to an arbitrarily short duration, within reason. 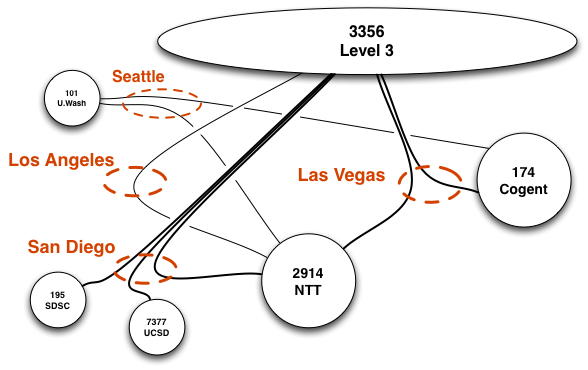 The figure below shows a pre-configured dashboard with the real-time congestion state of interdomain links from 5 large access networks in the US to 3 different content providers/CDNs (network names anonymized). Several graphs on that dashboard show a diurnal pattern that signals evidence of congestion on the interdomain link. While drawing pretty pictures and having everything run faster is certainly satisfying, it is neither the goal nor the most challenging aspect of this project. A visualization is only as good as the data that goes into it. Drawing graphs was the easy part; developing a sustainable and scalable system that will keep producing meaningful data was infinitely more challenging. We are delighted with where we are at the moment, and look forward to opening up the data exploration interface for external users. So what happens next? We are far from done here. We are currently working on data analysis modules for time series data with the goal of producing alarms, automatically and without human intervention, that indicate evidence of congestion. Those alarms will be input to a reactive measurement system that we have developed to distribute on-demand measurement tasks to VPs. We envision different types of reactive measurement tasks, e.g., confirming the latency-based evidence of congestion by launching probes to measure loss rate, estimating the impact on achievable throughput by running NDT tests, or estimating potential impacts to user Quality of Experience (QoE). The diagram below shows the various components of the measurement system we are developing. The major piece that remains is continuous analysis of the TSLP data, generating alarms, and pushing on-demand measurements to the reactive measurement system. Stay tuned! 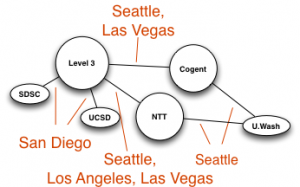 We set out to conduct a social experiment of sorts, to host a hackathon to hack streaming BGP data. We had no idea we would get such an enthusiastic reaction from the community and that we would reach capacity. We were pleasantly surprised at the response to our invitations when 25 experts came to interact with 50 researchers and practitioners (30 of whom were graduate students). We felt honored to have participants from 15 countries around the world and experts from companies such as Cisco, Comcast, Google, Facebook and NTT, who came to share their knowledge and to help guide and assist our challenge teams. Having so many domain experts from so many institutions and companies with deep technical understanding of the BGP ecosystem together in one room greatly increased the kinetic potential for what we might accomplish over the course of our two days. You are currently browsing the archives for the Topology category.